SKS, world-famous producer of bicycle fenders and pumps, is showing its national pride by allying itself with other German bicycle, component & accessory manufacturers to form a "Made in Germany" MTB Team. Precision engineering and high quality have long been elements of pride for manufacturers in Germany from automobiles to electronics to bicycles. 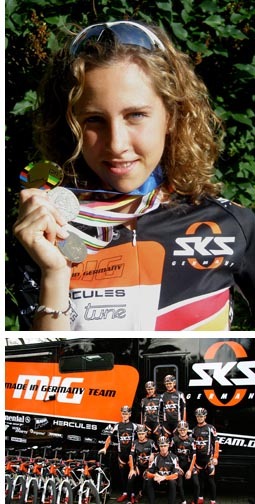 SKS is showing their allegiance by forming a team of German athletes using only bicycle equipment made in Germany. The team concept originated at SKS, and the company currently manages the team. Other official sponsors of the MIG "Made in Germany Team" include Hercules, Continental, Uvex, Magura, Vaude, Tune, Schmolke, Ultra Sports, Ergomo, Nokon, Rapunzel, Veltec, Natur*Sport, Staps & Adidas. The team consists of Ines Thoma, Manfred Reis, Fabian Giger, Markus Schulte-Lunzum, Marc Mensebach, Mona Eiberweise and Rumen Voigt. Team leaders are Matthias Beck, Mario Thoma and Jan Henning. The MIG Team has been very successful to date accomplishing more than 30 victories. With the title of European Champion and 3rd place at the worlds is Mona Eiberweiser, the rising star of the team. Together with Fabian Giger who was 4th at the European and World Championship in the U23 class, the concept shows what is possible with an enthusiast concept. The team bike is a Hercules Revo outfitted with the finest engineered products in the world, all coming from within the German borders. According to Jan Henning, SKS International Sales Manager and Team Leader, "The quest to create a MIG 'Made in Germany' team was a passion of SKS owner Willo Blome and has been well worth the effort to assemble these great Germany companies. We are showing that great bicycle products are still MADE in Germany, and that not all bicycle manufacturing has moved to the Far East. It is a bonus that our young team is performing so well this season." SKS Germany, founded in 1932, is a member of the Scheffer-Klute Group (1932-2007), Sundern/Sauderland, Germany. SKS is maker of the popular Xtra Dry & Raceblade fenders and original Rennkompressor floor pump. SKS also distributes pocket tools and chainguards worldwide. SKS is marketed in the U.S. by SKS USA, located in Olney, IL. For more information about SKS products, please contact SKS USA at 618-395-2400 or crystal.trout@sks-usa.com.